I am not completely sure if this is in our textbook but I absolutely love this image. 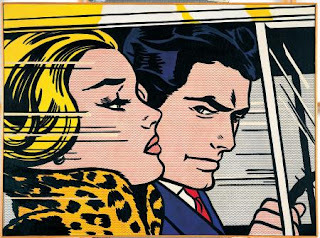 This is a cartoon comic strip called "In the Car" by Roy Lichtenstein. I love his work. though his characters are very similar to the ones from the bazooka gum comic strips, they are a classic. Each image is made with tiny dots just in some of the pointillism pieces and created to tell a story. Some have captions or bubble texts to them but not this one. It is a silent comic and I love the characters and the way it was created. Lichtenstein uses only bold primary colors in his pieces and is able to capture the eyes of his observers. It is an image that i have come to love ever since I was exposed to his work and I continue to look into his work regularly.